With references for sales tax, gratuity, discounts, percent change, credit score, income tax, filing federal tax returns, mortgages, paychecks, budgets, fixed and variable expenses, checking accounts, checks, savings accounts, compound interest, exponential growth, financing a car, amortization, down payments, front-loaded interest, interest rates, owning a car, the stock market, profit and loss, this word wall is a great addition to a personal finance or consumer math classroom. Please see the preview for what it included in this download. 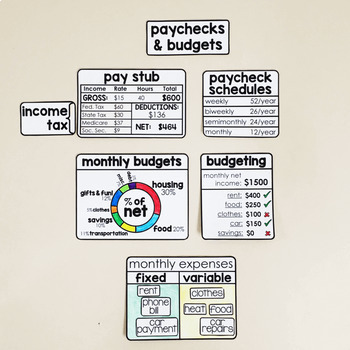 The word wall is in black and white so that you can color code it the way you would like to help your students make connections. Everything prints on 8.5x11 computer paper (the graphs you see in the photos are about the size of computer paper). You can see most of the pieces included in the word wall in the preview. 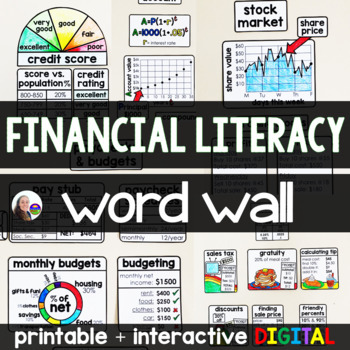 Photos of each section of the word wall are included in the file to make setup easy. 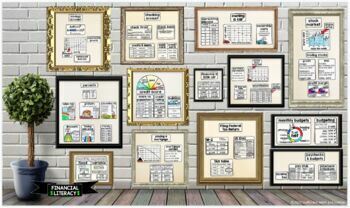 I wrote about 5 ways math word walls have changed my teaching in this post. 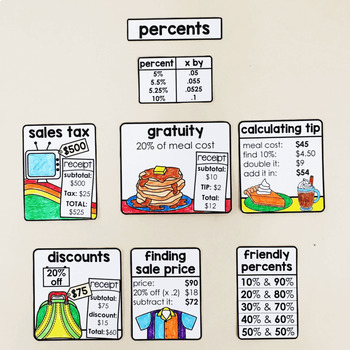 See more math word walls.